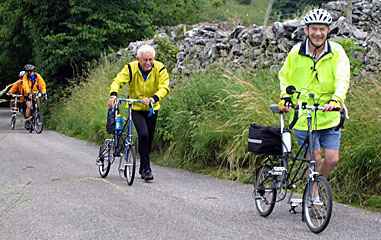 John Kinsey has been organising a ride using parts of the High Peak and Tissington trails in the Peak District, near Ashbourne, for some years now. I have been to a few in the past, but unfortunately have not attended them all - they have either clashed with other commitments, or there have been problems in getting there and back. Having recently gone back to owning a car, travel presented much less of a problem this year, although the diminutive size of the Smart meant that I was not sure how easily I could pack a Moulton into it. Since the ride was likely to involve at least some off-road riding (though not of a very arduous kind), I decided to take the APB, and apart from splitting the frame, I removed the pedals and took out the seat post and bagged the bike. Bagging was only done to provide some protection to the bike and car. With the passenger seat folded down, and the bagged bike more or less lying flat, it all went in very easily, and gave rather better visibility than in normal unloaded configuration with the high-backed passenger seat in its upright position. The journey up to Parsley Hay, where we were due to meet at the cycle hire centre, was fairly uneventful, apart from the usual aggressive behaviour of other motorists, one incident resulting a A Close Shave. 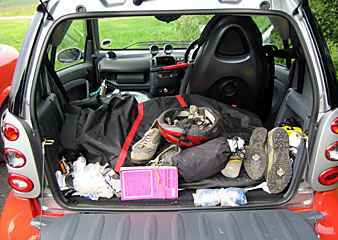 A simple split of the APB, removal of the pedals and seat pillar, allow it to fit into AM bags, which go easily into the back of a Smart. On the way back, I did not even bother to fold the passenger seat, and it still all went in comfortably. The weather was slightly dull when I arrived, as it had been when I left Dudley, and as it was quite cool I was glad that I had not made a mistake and worn The Wrong Trousers - I changed from shorts to Rohan Convertible Bags just before leaving on the basis of the conditions. I arrived before 10:00am, but a few riders were already present, and by the start time of 10:30 we numbered 8 - 3 F-frames, 2 AMs and 3 APBs. The owners of the F-frames were a brave bunch, choosing to ride with limited gears in this terrain. A two-speed Sachs Duomatic is not my choice under most conditions, let alone in such hilly country! Soon after we started I had trouble selecting bottom gear on the hub of my 3 x 7, but that still gave me 14 gears, which is a lot more than the F-frame riders had. The selection problem was only due to the handlebar lever not self-returning properly after the change from top to middle gear, so it was an easy matter to give it a little manual assistance, and later on the ride I would be glad of the lowest gears. There were a number of steep hills, which defeated those not on APBs - but even walking is enjoyable in this countryside. We made our way at a comfortable pace through lanes to the lunch stop near Carsington Water. 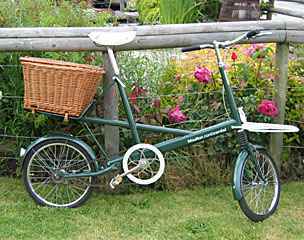 Jeremy Taylor's immaculate 2-speed Moulton Continental, complete with a fine wicker rear basket, pictured at the lunch stop. After the large portions of lunch, we had some qualms about being able to cope with the rest of the ride. Two of our number had to leave at this point, for other reasons though, so we were down to 6, the 3 APBs, 1 AM and 2 F-frames for the remainder of the ride. After a brief stop at the visitor centre, we set out to ride most of the way round Carsington Water. This is quite an undulating ride, with some stretches of loose gravel, and some quite steep ascents and descents, and it made for quite tiring riding. The gears and tyres of the APBs put the riders of these machines at quite an advantage. As we left the track to make our way back, another member left the group, so now we were 5. Those remaining in the group after the lunch stop, during the ride around Carsington Water. This was the most dangerous part of the ride - Jeremy Taylor (Right) gashed his knee on one of the bikes while the photograph was being taken! At this stage we decided to diverge from the planned route a little, to give a slightly more direct return route, but this resulted in a long, steep climb up to the High Peak trail, which again gave the APB riders an advantage. Once on the trail, another of the group departed his separate way (the opposite direction to the rest of us), so we were down to 4 riders - 2 APBs, 1 AM and one F-frame. This last stage of the ride back to Parsley Hay was off road, but on a good surface, and with only minimal gradients - I don't think I changed gear during this section of the ride, and the remaining 2-speed F-frame Stowaway was not really at a disadvantage. We got back to the start point at about 5:00pm, and it was then just a case of packing the bikes back into the cars and saying goodbyes before we set off for home. 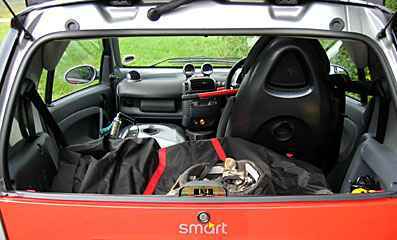 For the return journey, I stowed the APB upright in the back of the Smart with the passenger seat upright, rather than folded, and it was still an easy fit, though with a slight reduction in rearward visibility. It was in disassembling the APB that I used, and then failed to pick up, my favourite set of allen keys - still, worse things happen at sea. Another time I might not even bag it, but just wrap it up in a couple of old sheets instead. As on the outward journey, aggressive drivers made the journey unpleasant, but without the car it would have been difficult to get there and back, and would have resulted in a very long day, even if the trains had actually run on time and allowed connections to be made. Our total cycling distance was just over 50Km, but as a fair bit of this was off-road, and there were a fair number of hills, it was quite a good days exercise. I have nothing but admiration for those who tackled it on 2-speed F-frames - I couldn't have managed it. The surface, as well as the hills, meant that an APB was really the best choice, though the riders of the other machines did not have any real problems. 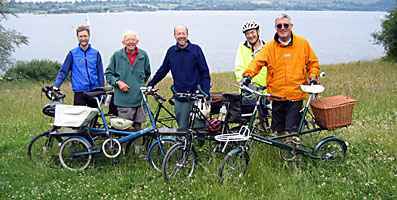 Many thanks to all those who took part, and particularly to organiser John Kinsey for arranging the ride and working out an excellent route.